Bigger isn’t always better, but oenophiles may beg to differ when it comes to Riedel Vitis stemware, the tallest machine-blown Riedel collection to date. Not only are they stylishly tall, but each of the seven varietal-specific glasses–Cabernet, Pinot Noir, Champagne, Riesling/Sauvignon Blanc, Syrah/Shiraz, Montrachet and Martini–are all the same height, adding uniformity to place settings and cabinets. Designed by Georg Riedel, the sides of the Vitis bowl flare outward before narrowing towards the rim, maximizing the surface-to-air space and allowing the wines to aerate within the glass. As the stem is pulled during manufacturing, the base of the bowl is drawn into the very top of the stem. The result is a triangular indentation at their union that is both pretty and practical: while giving each glass a unique look, it also helps trap sediment. Named after the Latin word for “vine,” the Vitis line of lead-crystal stemware should be able to withstand the top of a dishwasher, although washing by hand is recommended. And, because they’re Riedel, they’re each designed to bring the best out of what they contain. 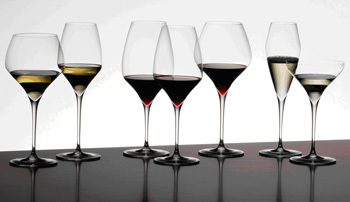 For more information on this glass and Riedel's other stemware, visit www.riedel.com.